Scotland's Martin Campbell and Patrick MacHugh have won the men's doubles at the Hungarian International in Budaors. 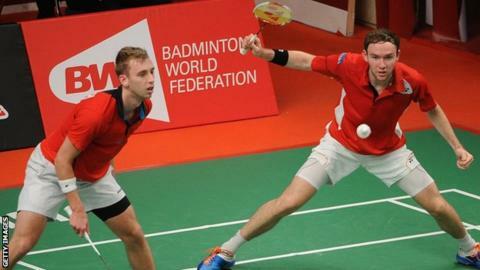 The top seeds beat Danish second seeds Soren Gravholt and Nikolaj Overgaard 21-13 18-21 21-16 in Sunday's final. England's Christopher Coles and Victoria Williams, who had never played or trained with each other before the tournament, won the mixed doubles. They beat Patrick Buhl and Isabella Nielsen, of Denmark, 21-19 11-21 21-17 in 49 minutes. Campbell and MacHugh were playing in their third final this year and the result should lift them higher than 62nd, which is their best world ranking to date. In addition, it gives them a boost heading into the Scottish Open later this month at Glasgow's Emirates Arena. To reach the final Campbell and MacHugh had to overcome team-mate Adam Hall and Coles in the semi-finals. Scotland's young prospect Julie MacPherson also had a good tournament, winning two rounds of qualifying to reach the main draw of the women's singles before victories over New Zealand's sixth seed Anna Rankin 21-8 5-4 retired and Hungary's Daniella Gonda 21-10 17-21 21-16 showed her potential at senior level. That earned her a quarter-final with third seed Chloe Birch. The England player won 21-12 21-9 on her way to the final before losing to Indonesia's fifth seed Aprilla Yuswandari 21-19 21-9.